A mysterious artifact should empower the Roman Empire, but a long journey through hostile lands lies before you! While the scouts progress, you have to protect the outposts. And the members of the ancient cultures you cross aren’t quite happy about your mission! 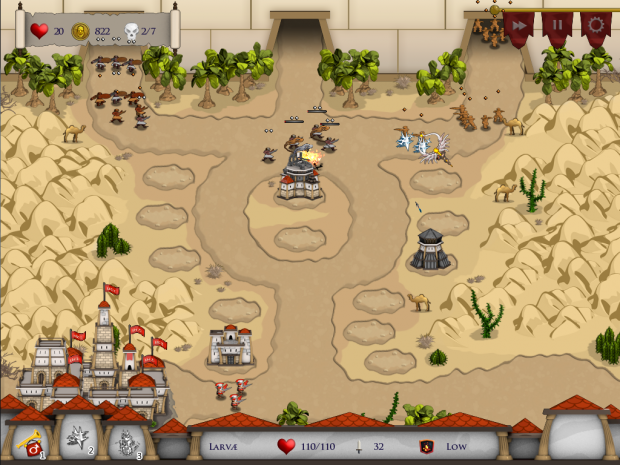 * Protect Roman outposts in 15 story missions * Press your luck in the 15 extra-hard challenge missions! * Experience 3 different scenarios while crossing the borders of the ancient Europe and Africa * Build 4 different towers with 16 specializations to hold the attackers back * Gain access to 3 magical spells given to you by the Roman gods … and a lot of enemies who don't want to obey the Roman Empire! New screenshots of Rush on Rome which shows two more levels from the third style from the game.